By Nick Engelfried of Hillsboro, Oregon. Nick is a senior at Pacific University, graduating with a degree in Environmental Studies. He describes himself as a clean energy activist and a volunteer for the Cascade Climate Network. Previously, he contributed "Youth Climate Movement Gathers Steam"
At a time when the future of Oregon’s only coal plant – the Boardman facility – is making Oregonian front-page news, we can draw a lesson from recent events in Kingston, Tennessee. 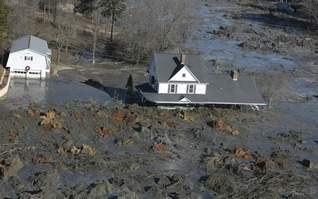 On the 23rd of December, a retaining wall broke at a Tennessee Valley Authority coal plant in Kingston, spilling more than a billion gallons of coal sludge and slurry over 400 acres. By sheer volume of material spilled, this environmental catastrophe rates far above the Exxon Valdez oil spill of 1989. Politicians of both political parties are touting “clean coal” as a solution to our global warming problems. But the Kingston spill raises the question of how clean coal can ever actually be. It’s not just a theoretical problem here in Oregon: the Oregonian recently highlighted the debate taking place over the Boardman Plant, which will almost certainly either be “cleaned up” or shut down within the next decade. Proposals to clean up Boardman include the installation of equipment to scrub nitrogen oxides, sulfur dioxide, and other pollutants from the plant’s effluents. However, such efforts would do nothing to prevent accidents like the one at Kingston. Currently available pollution-control technology also does not address carbon dioxide – the most important greenhouse gas. As the Oregonian points out, the worst possible thing would be for PGE, Boardman’s owner, to commit to spending millions of dollars on cleaning up the plant, then decide to close it down anyway because of carbon dioxide emissions or other environmental problems not addressed by the cleanup plan. What’s certain, though, is that carbon dioxide will be regulated soon on the federal level; and if the cost of polluting becomes too much, PGE will end up shutting down Boardman. The problem can be avoided if Oregon commits to decommissioning its coal plant now. Instead of spending millions of dollars on a plan that attempts to make coal “clean,” Boardman should simply be taken off-line. It’s the only viable way to address the plant’s contribution to global warming. One thing we can learn from Kingston is that coal will never be clean. Amen, brother, amen. The proposal to spend hundreds of millions to reduce just some of the nasties that Boardman emits is insane, as it would just lock PGE into trying to keep the plant operating even longer. Boardman must go. Convert to natural gas, or concentrated solar, or just shut down and run a crash program to find 600 avg. MW savings. Sure, focus on what entire nation is focused on....meanwhile Westinghouse and OSU are busy developing "safe" nuclear energy technology. Let us solve the growing problems in our backyard before we scrutinize those around the country. Zach -- isn't Boardman, Oregon in Oregon? Just curious, what energy sources do you consider acceptable? You hate nukes. Any fossil fuel source sux. Wind is bad for migrating birds. I am sure you have some problem with solar. Do I need to stock up on candles? I'm no fan of coal dirty or clean, but if you are going to propose decommissioning a plant that serves 1/3 of all PGE users and is the cheapest power source in the PGE system, I think you are obligated to propose some sort of alternative. I wonder what percentage of Oregon residents are even aware on a day to day basis that the electricity for their lights comes from the kind of activity that the Boardman facility relies on. A point raised in the O article is probably correct: most Oregonians likely assume their electricity comes almost exclusively from hydro power. Despite the very visually appealing engineering marvel presented by reservoir dams, they have turned out to be a major compromise to the quality of Oregon's environment. The coal burning plant appears to be very bad for our environment, yet it doesn't even have the dubious redeeming visual appeal of dams. Individually, when they finally know and understand the damage dams have done, I think Oregon residents are very concerned that something be done to not perpetuate more of this kind of damage through other forms of power production. Meanwhile, if we're not able to produce enough safe, clean, responsible power for the Oregon's needs, why do we continue to allow that need to grow? his reply was "16 tons of ash an hour, most of which goes into cement as a binder. The rest is buried in their landfill adjacent to the plant. Not sure it could leach 16 miles into the Columbia, but who knows what the groundwater table does out there. It's certainly not good, even if theyre just burying i nearby. you're right, it's a massive waste stream. I agree with much that you say, but not the last paragraph. I think there may be such a thing as “clean coal.” It may be very costly. It just seems a bit anti-science, or at least anti-technology, to think that we can not find a way to make coal clean. I am tired of the anti-science wing of the Republican Party which does not believe in global warming or climate change. I’d prefer not to see the Democratic Party taken over by an anti-science wing that does not believe in technological solutions to problems. Let us be driven by science, by developing new science, and by costs. My real dilemma on this issue is not just Boardman but all those coal plants in China. Looking ahead, what China does with its current coal plants and the approximately one additional coal plant it adds each weak will determine how much the globe warms up. Boardman counts for little. Our issue is how can we influence China to do better? Would our closing Boardman influence China to switch from coal to some form of clean electric power? Or would our investment in clean coal technologies for the Boardman plant influence China to adopt similar technologies for its coal plants? Which alternative (or yet another) has the better probability of reducing total global carbon emissions, not just those from the Boardman plant. And, of course, what else can we do to influence China to clean up or close down its dirty coal plants? @ mp97303: Wind has its problems and limitations, but birdkills are not one of them, presuming you don't site a turbine right in a migratory flyway. Housecats kill several orders of magnitude more birds each year than wind turbines do. Not to mention, when climate changes quick enough to disrupt predator-prey relationships that birds have evolved to depend on --- which has already been documented --- we'll be extirpating whole species in a few years, not individuals. The Boardman Power Plant is a 585-megawatt coal-fired electricity generating plant in northeastern Oregon. It is one of PGE’s most cost-effective sources of power, producing electricity at a variable cost of one-third to one-half the price of electricity on the wholesale power market. Boardman provides about 15 percent of PGE’s total generating capability, making it a key resource in meeting our customers’ current and future energy needs. 600 MW is not trivial, I grant you, but 15% is a hell of a lot less than a third. As for "cheapest" source of power, that's only if climate-aggravated draught and crop losses, firestorms, heat stroke deaths, and loss of biodiversity are free and the increasing violence across the world from climate refugees is not something of concern. Coal is not clean or cheap; we just pay the costs through taxes and health care bills rather than through the electric meter. Thank you for this post. I worked in coal steam plants and regularly handled the coal and the waste. We never were told that the waste was toxic. When an energy source is described as "clean", we must look at the total picture, from extraction to waste disposal. If not, nuclear energy ends up being called "clean", despite the horrific irreversible impact of nuclear waste. We have a classic example of that here in the NW, where the Hanford Nuclear plant left a legacy of cancer deaths for people living near it. As for coal, even if we can clean up coal burning emissions, what harm comes from mining it? Isn't it dire enough that mountain tops are blown off, and miners are doomed to almost certain death from exposure to coal dust. No can we ignore the impact of waste, as the Kingston disaster illustrates so well. I am not even reassured by the reuse of coal waste in cinderblocks.I am now starting to wonder if cinderblocks are toxic, since they contain coal waste, which includes high amounts of mercury and arsenic. Where are the studies that illustrate that those toxins are not leached or off-gased? It seems to me that the bulk of our money and technological research should be directed toward truly safe, truly renewable, truly clean sources of energy and towards energy conservation. Anything short of that is foolish. Yes, but very special candles. For years I've proposed rendering environmental terrorists for their body fat. There was some Indian ruler that used to send agents out on the sly to see if merchants were cheating customers (with bogus scales). If they found a perp, he would send soldiers to cut off that amount of body fat. It's clean sustainable energy and the far right is a regular adipose army! I think Dave Porter's comment is right on target. We CAN clean up coal. There are also ways to recycle nuclear waste into other plants making nuclear power, which I am told are going on successfully in Europe (not that waste is the only problem with nuclear, of course). There are 43 coal plants in the U.S. which could be built but are not proceeding because the carbon regime has not been set nationally. In the meantime, we need to make Oregon a leader in cleaning up coal, by starting with the Boardman plant, or shutting it down until it is cleaned up. Making its energy more expensive (thus cleaner) should be acceptable if we're serious about global warming pollution and other kinds of air pollution, including acid rain. Conservation, such as insulation and other energy-use-reduction measures, should be a big part of the answer. The PGE guy in the Oregonian (Piro I believe) has the wrong message on conservation. But he makes sense when he says a private sector company like PGE has a hard time reducing its revenues by supporting conservation. That's one reason why many of us wanted to make PGE a public utility, and felt Erik Sten was on the right track. If Oregon is not up to making PGE public, maybe we should insist that the Governor appoint a PUC who will deal with the questions of rate return Piro raises in a way that encourages appropriate decision-making. There are two questions here -- one is being sufficiently determined to proceed with things like carbon taxes, which should be greatly preferred to cap-and-trade. The other is how to transition to a zero carbon world. Let me say that I think we're really behind the eight ball in transportation, even more than in energy generation. Sequestration of carbon from coal plants, and good conservation efforts are not that difficult, for example. Going gung ho for solar and wind aren't a problem either. The problem is dealing with existing plants like Boardman, and that problem can be solved with money. Whereas, getting away from fossil fuels in vehicles means converting our existing fleet of vehicles and putting a new support structure in place for the new vehicles and new fuel. When transportation supplies 40% of global warming in Oregon, and ODOT and the Governor are determined to build things like a $4.2 billion Columbia River Crossing with 12 lanes of travel-inducing capacity, it puts the lie to the Governor's saying he wants Oregon to lead the nation in fighting climate change. I personally feel the conversion of our vehicles and their fuels is the bigger problem, and the one that is going to take us much longer, and in the meantime we need to lead the nation in reducing vehicle miles traveled with our fleet of fossil fuel vehicles. That also means we need to spend a lot more money on transit and rail, and a lot less on new highway capacity. Try fighting that battle politically -- it's a bearcat -- but its also at the heart of saving the planet. I wonder what percentage of Oregon residents are even aware on a day to day basis that the electricity for their lights comes from the kind of activity that the Boardman facility relies on. So long as it's out of sight, out of mind, advocates of things like electric cars and electric-powered light rail can pretend it's clean power. Out of sight, out of mind. Nuclear really needs to be re-considered. When people lack knowledge of how and why it works, they are too prone to filling in the blanks with fear. Fear of the unknown. People have been searching for a way to make fusion work for over 50 years, and it remains at least 50 years off. It's the energy source of the future (and probably always will be). So when you suggest that skepticism about techno-fixes --- magical technologies that allow us to keep doing what we're doing, only on some new fuel/system --- is "anti-science," that seems more like projection than reasoned criticism. Regardless of the feeling, the fact is that even a new, magic bullet system for stripping carbon out of coal would leave us with a very-nearly incomprehensibly sized toxic waste stream. Vaclav Smil, a noted energy researcher and writer, suggests that trying to sequester carbon from coal would mean building a system capable of dealing with a volume of this dangerous that is more than ten times the volume of the petroleum we handle each year. And we would have to have super-high confidence in the sequestration, because any leaks would (a) undo the sequestration; and (b) likely kill a lot of people if nearby; or (c) result in a pH shock to marine systems (which we're already seeing). Your comments about China being the problem are probably not well-received in China, where the average person uses 1/30th of the energy of the average Oregonian. Not to mention the fact that the West (US, UK, AUS, CAN) are responsible for more than 80% of the increase in CO2e. In other words, virtually all the climate disruption to date was caused by us, and the amount already programmed in by our past emissions -- at least another .6C, per NASA even if all emissions ceased at this moment -- is mainly due to western emissions, not those of China and India. Moreover, although you call Boardman small, a ton of coal is a ton of coal is a ton of coal, no matter where it's burned. We only have one atmosphere, and we share it. So if Boardman is small, per you, than it should be easy to shut down. @ Ron Buel: The problem with focusing on cars before central station power plants is twofold. First, we don't have any regulatory system in place for cars. Developing that and getting past the brainwashing of 1950-2009 that "cars = freedom" is not going to be easy, and we don't have a lot of time to fool around being ineffective. Boardman is a huge problem all by itself, it exists under a regulatory regime of the OPUC, and can be shut down with the stroke of a pen: The OPUC issues an order saying that it is no longer reasonable or prudent to allow PGE to include coal in its portfolio and that, henceforth (after some short transition period -- maybe two years), coal costs and costs to operate or maintain the plant for coal combustion are no longer recoverable in rates. This is actually what the science already says --- we have the perfect carbon sequestration system already ... it's called coal, and if you leave it in the ground, it will hold onto that carbon for essentially forever, in a stable, compact form. But any attempt to have our cake and eat it too -- to burn the coal but not get the carbon -- is simply hubris and will continue to destabilize the climate even further. Closing the Boardman coal plant is being premature. First you have to replace 600+ Megawatts of electricity being generated by the plant. Where would you get it? Wind and solar power are only supplemental energy sources (wind power are intermittent at best and solar are good when the sun is up). There are not enough hydroelectric plants to replace that much energy. Which means that PGE would have to purchase power somewhere else. Some of the comments I read suggest nuclear power plants. I strongly agree, but NOT JUST NUCLEAR power plant. They should get into geothermal and tidal wave energy. Anti-nuclear activist should like the idea of geothermal. Before you build a nuclear power plant, consider reprocessing of all nuclear waste for fuel. That way, you can solve the fuel problem. Do this and we would slowly replace the coal-firing plants or convert them into coal refineries to gasoline for our vehicles. Coal electricity is 50% of the U.S. Power consumption. It can be replaced by adding nuclear, natural gas, and geothermal power plants. Tidal wave, wind, and solar can be supplemental power sources that at best can be used during peak times. Hydroelectric can be used during seasonal or heavy peak times. I believe that clean coal can reduce emissions, but not to zero. Clean coal is only a temporary fix until we get out of coal or convert coal to oil. The only way is to add more nuclear, natural gas,and geothermal power plants. I agree with your general points about China (& India). They use far less energy on a per capita basis and historically they are not responsible for much of the current build up of CO2 in the atmosphere. If we expect them to pay the full costs, I doubt we should hold them to the same emission standards as ourselves. It probably would not be fair. But the reality before us, as I see it, is that what they do or do not do with their current and future coal plants will have a very large impact on global warming. This view colors my thinking about “clean” coal, and what to do at Boardman. Perhaps our role is to develop “clean” coal technologies so that that China can adopt them (with or without our financial assistance). But perhaps coal cannot be made “clean” enough, as you suggest, for China, or cannot be made cleaner at any reasonable costs, then what will China do? Is there another less expensive source of clean power on the scale that China needs? If not, then what do we do? I have no specific ideas about how we in Oregon can engage China on these issues, but I think we should. I have been searching for ideas. I appreciate the science like facts you put forward. I do have lots of concerns about coal. I am also glad to learn that the Oregon Public Utility Commission has control over Boardman. I’ll look to them to create a process for thinking these issues through. I am a supporter of a substantial, revenue neutral gas tax. If Obama does not propose one by the end of the 2009 Oregon legislative session, then the legislature should refer such a measure to the people for discussion and a vote. I’ve written about it on my own blog, most latelyhere. Closing the Boardman coal plant is being premature. First you have to replace 600+ Megawatts of electricity being generated by the plant. Why? Who says? Boardman is the dirtiest, least efficient plant going. Any power purchases to make up for the reduced supply will make the net grid less dirty. The WPPSS fiasco proved that projections about demand are not necessarily correct. Somehow, we got through without completing 4 of 5 reactors that we were assured repeatedly were CRITICAL to the health and well-being of the Pacific NW. Instead, negawatts -- conservation -- took off, and our economy improved. If Boardman were destroyed in a fire or other catastrophe tomorrow, the Northwest would do fine -- the OPUC, the Conservation Council and (one hopes) the utilities would rally and put a higher value on getting those negawatts that we need, and we'd muddle through. On the hottest days, we'd have to turn more things off more often, but that's not the end of the world either. @ Vinny & Paul: The unthinking belief that we need every megawatt we currently use is not only false but dangerous, as it leads us to accept the unacceptable (burning coal). I don't have a way to guarantee that China and India will respond positively to our shutting down Boardman --- but I know how to guarantee that they won't do anything about limiting their coal use: refuse to limit our own. The Bush recession/depression may well be our last chance to get this right: demand for electricity will slow as commercial businesses fail in droves and industrial production slows. So we can afford to idle some of our capacity, particularly the dirtiest part. The argument that idling Boardman will raise power rates is bogus --- if we take the hundreds of millions proposed to spend on exhaust mods for Boardman and plow that into conservation in Oregon then even as rates increase, total bills can drop. P.S. "Nazi gas" -- Coal to liquids -- is even dirtier than just burning coal to make electricity. Coal is not the answer to any problem, coal is the problem. P.P.S. Nuclear is a distraction at this point, a debating sidetrack. Oregon won't site any nukes anytime soon, even if the law allowed it. We don't have 15-20 years to debate all this, which is a fair estimate of the time that would be required to revise the law and build any nukes in Oregon. Investors won't put their money into nukes unless the feds guarantee the investment, so the market is saying that they don't think nuclear is the answer. Maybe it is, maybe it isn't, but any time spent debating the question is simply time wasted while avoiding the real issue: we have to stop bringing concentrated fossil carbon (coal) into the biosphere. We have one such plant in Oregon, with a second (a coal-burning ethanol plant) proposed. So we're pretty much not overly dependent on the stuff. Trojan shut down and all the parade of horribles about that failed to come true, and PGE has saved billions. Let's shut down Boardman now and avoid the rush. If we don't, then we're telling Obama that we want to TALK about the climate crisis, but we don't actually want to do anything about it. The sooner we rip out the coal-burning guts of Boardman, the sooner the visibility in the Gorge improves, the health of Oregonians improves, and the sooner we can be figuring out what sort of power plant(s) to put into Boardman to use the site and the transmission already there, AS we need it (a hybrid concentrated solar Sterling-cycle plant and wind farm would get my vote, with a natural gas fired combined cycle turbine as backup/spinning reserve). Zach - Since you are such a hot environmental engineer (which is fascinating since I didn't even know Pacific was an engineeering school) - What exactly does PGE do with its coal ash? Advice - Beofer you publish something, as others note your inaccuracies, try to understand an issue before making suggestions. P.P.S. Nuclear is a distraction at this point, a debating sidetrack. Oregon won't site any nukes anytime soon, even if the law allowed it. We don't have 15-20 years to debate all this, which is a fair estimate of the time that would be required to revise the law and build any nukes in Oregon. That is a very good point. It has been that way with US nukes since day one; make the system so clunky it can't work, then say nukes don't work. Now it's too late. We don't have the infrastructure and would have to almost start over. France is very serious about nukes and doing them right. The French government designs plants and you pick from an approved operating model. Regs are tailored to design, a priori. Here, every nuke, practically, reinvents the wheel. Besides adding hugely to costs, its an end-run to create situations the regulators don't know to look for. Whenever anything unexpected happens, the design is found wanting. This is calculated by fossil fuel interests to make them problematic. Think about that when you evaluate nukes. If you want to know if micro-brews are really better than insipid, yellow, fizzy, pasteurized beer, do you ask a drunk? Almost all nukes are owned and operated by fossil fuel companies. Our experience to date isn't exactly objective. How many "experiences" with wind, solar, etc., are also based on the "trials" of fossil fuel companies? It's not all BS. They can see some advantages to those techs being workable. They will always look at the balance sheet cynically, and I don't expect them to be thinking like institutes dedicated toward making alternative techs work would. Bob N: "who knows what the groundwater table does out there. It's certainly not good, even if theyre just burying it nearby. you're right, it's a massive waste stream." People smarter than the IQ's here do - and why do you think it's not good. Do you know how to design a permitting landfill site, monitoring program and remediation program? Do you know there are ponds and landfills all over the place that separate landfills with groundwater. Until you do and can prove the engineering design "is not good" then you need to not throw out statements like this. Do you know that the professional engineer code of ethics forbids professional engineers throwing around assertions like this without facts and notifying the design engineer first, with a chance to respond. I'll bet you won't provide PGE with your "analysis". Steve - Pacific doesn't have a engineering program. Environ studies has nothing to do with engineering - although there are people in the program that are willing to act like engineers. The PE code of ethics is in place for a reason. If one wants an education in environmental studies - go to OSU and obtain a degree in Civil Engr and a masters in Environmental engineering. Nuclear fission is the only technology to alleviate carbon concerns. Simple as pie to understand. However, these posts and "analysis" show we are getting less intelligent as a society. @ Paul G: How does a plant that only provides 15% of PGE's power get inflated to "serving a third of PGE customers"? George, fault me for incomplete research, but the 1/3 number was calculated by taking the total number of PGE customers (generally reported around 700,000) and the 250,000 number I've seen that Boardman powers: for instance at OPB . Sorry can't find the other places. Still, the 15% figure from PGE is surely accurate. Strategic planning would be to encourage onsite independent sources of power and using the grid for surplus distribution and backup power. Reversing our priorities to conservation and developing technology for independent small scale power production should reduce our need for large scale centralized power plants. A well crafted electrical conservation tax where the proceeds were divided equally among all voting age rate payers, with credit for dependents, might gain some support among the general population. Americans can be quite competitive and the winners would be those that conserve energy and produce their own power. A substantial tax that doubles the price of electricity would likely result in reduced consumption. But the main benefit would be to encourage energy saving habits and weatherization and make new technology competitive which should create many new jobs. Hardship grants and loans could be funded by utilities from reduced investment needs for new centralized power plants and expensive upgrades to the grid distribution systems. Production related businesses would need special treatment to prevent inflation. I feel that without strong incentives for conservation the price of electricity will double in the future regardless and we won’t personally be able to weather the storms when grid power goes down. Regarding its nuclear plants, has France resolved upon a way that won't require that the radioactive waste produced from be locked away for centuries? It seems, that was the problem with nuclear plants of the era that PGE's Trojan facility was designed in. Fears of Chernobyl notwithstanding, PGE seemed to run Trojan reasonably well. It was the problem of waste disposal that brought that sensibly brought nuclear in Oregon to an end. PGE never was able to figure that out. It's been awhile since I've read about what France is doing about its nuclear waste. Something like Vinny says..."...consider reprocessing of all nuclear waste for fuel. ", sounds good. I'll be surprised if there aren't some very serious caveats associated with France's nuclear program to be concerned about. Simple, not all customers are created equal. People who make less than $25,000 annually will have their rates cut by half. For people who make $25,000 to $50,000 annually, the rates will stay the same. For people making $50.000 to $100,000 annually, rates will be increased by 10 percent per $10,000 of annual income. For people making over $100,000 annually, rates will be automatically doubled. For people making over $250,000 annually, rates will be automatically tripled. All rates will then be indexed for inflation. Small businesses must also receive a rate reduction while large corporations would be required to pay more. With this type of ability to pay legislation, the costs of replacement power will be placed on the backs of elitist well-to-do eco-mouthpieces at the upper end of the income scale rather than the same old business as usual of passing the costs off on people at the lower end of the income scale and people on fixed incomes. ws: "has France resolved upon a way that won't require that the radioactive waste produced from be locked away for centuries"
Nope, because they can't figure out a way to violate the Laws of Physics. However the waste disposal was solved a few million years ago by nature, store it in the ground. Where do you think the "waste" comes from? Nuclear fission material isn't created by humans. It's mined, used for energy and then placed back underground where it would have been all along if it wasn't mined. Not even progressive or Obama can change the half-life of nuclear material. The one advantage though is that nuclear waste processed by humans would be safer because the location is known with 100% certainty and kept from the groundwater and drinking water contamination. If progressives don't think uranium (nuclear material) contamination in groundwater isn't a concern monitoring then you should leave the Portland metro area bubble and explore the world a bit. You don't have to go far. About 300 miles is enough, but I encourage you to travel farther. How does a plant that only provides 15% of PGE's power get inflated to "serving a third of PGE customers"? Does it matter even if we were to take out "only" 15% of capacity, PGE is running right on the ragged edge of power production and that would mean some kind of cut back for everyone since BPA is pretty sold out now. Again for all the people who don't like coal or dams, what is you solution besides saying no? There is no way wind or solar would even replace 10% of Boardman. @ Steve: There are far more than 600 MW of untapped electrical energy savings in Oregon. We continue to act as if this was 1950 and the only solution to demand is to crank up more supply. We have one of the "best" residential energy codes in the country --- yet it's a code that essentially locks in long-term energy demand at a high level. We won't let people build a house without a garage or a driveway but we'll happily let people build a house that ignores prevailing winds and solar orientation. We let developers squander the opportunity to install ground-source heat-exchangers that could be heating and cooling our buildings at a fraction of the current energy use (and cost). We have tens (possibly hundreds) of thousands of square acres of flat, unshaded commercial and industrial roofs that could be generating electricity precisely when our demand is highest, opportunities that sit idle because PGE and other IOUs get more profits for selling more power, not for conserving. We waste (and pump, and pump and heat and pump and filter) billions of gallons of water, which extracts a huge electrical energy penalty. We don't require builders to guarantee the energy performance of their homes, or even to put an energy label on them to permit comparison shopping, the way we do with appliances. We don't require smart-meters so that customers can, in their kitchens and by their thermostats, know how much power they're using and how much they've used since their last bill. We don't require utilities to offer time-of-day rates so that people have an incentive to shave energy use during peak hours when the grid is stressed. And, even as we speak, we're watching tens of thousands of huge, energy-sucking plasma and LCD TVs go into homes to replace perfectly good TVs that draw far less energy. A big screen plasma TV uses as much energy as a refrigerator. In short, we've done essentially nil to get serious about conservation. In conservation, we're at the same stage that bottle recycling was before the bottle bill, when we tried to get people to recycle only through exhortation. Energy prices are skyrocketing. Since Oregon imports most of its energy, this hurts all Oregonians – as unemployment data, foreclosures, and state revenue forecasts show. Until Oregon produces more energy, energy efficiency is our best defense. Bendites will spend roughly $84.7 million for electricity and natural gas during fiscal 07-08 (Bend finance dept.). The rest of Deschutes County likely will spend a similar amount. Most of this $170,000,000 leaves the area, to pay for fossil fuel, and coal-fired and hydroelectric power. That’s an economic drag. Energy efficiency – insulation, upgraded equipment, smarter operation – could probably save 20% or more of this. Keeping $34,000,000/yr more in Deschutes County – providing more local jobs, more disposable income, and a better standard of living - is enticing. Oregon’s government recognizes this. There are state tax credits, loan programs, and subsidies from the Oregon Energy Trust. Free or low cost energy audits help guide choices. These programs pay SOME of the cost of insulation, equipment upgrades, etc. – for those who choose to invest. But relatively few homeowners and businesses actually have invested in energy efficiency. Why? Tax credits aren’t persuading those who pay no taxes. And some homeowners, especially retired or low-income folks living from check to check, can’t muster cash to invest in savings opportunities, even those with quick payoffs. Instead, we offer charity [LIHEAP] to help pay their utility bills. And many renters and businesses have no incentive to invest. For homeowners, here’s the problem. The Oregon Small Energy Loan Program (“SELP”) has a minimum loan size of $20,000, and a loan origination fee of $525. Unless you own a mansion, upgrading windows or insulation requires a micro-loan, too small for SELP. If you qualify for credit, this puts you into the small dollar financing markets. There, high loan fees and/or interest rates make any but the fastest payback upgrades unappealing. If you don’t qualify, you can’t invest; all you can do is try to operate more efficiently. And loan officers, red tape, additional payments, credit card debt, etc. discourage many who’d otherwise happily cut their utility bills. Renters and many local businesses occupy rented or leased facilities. They pay the utilities; somebody else owns the building. Why would a tenant invest to improve someone else’s property, when the pay-off takes longer than their rental or lease agreement runs? And for landlords who don’t pay the utilities, low cost trumps efficiency. The Oregon Department of Energy doesn’t favor increasing the Business Energy Tax Credit (now 35% except for renewables). ODOE would rather not further enrich those landlords who knowingly chose to build inefficient low-first-cost buildings to maximize leverage and profits. The result: We have lots of energy efficiency projects, “low-hanging fruit” with short paybacks and attractive savings, that aren’t getting done. This holds true throughout Oregon. Statewide, we spend about $10 billion/year on energy and motor fuel; $8 billion goes out of state (ODOE). The answer is 100% public financing for qualified energy improvements. Public infrastructure - roads, bridges, water, sewer, airports, etc. – needs investment for a healthy economy. Privately owned buildings and facilities are also part of our infrastructure. Investing in their efficiency will benefit everyone. However, using additional tax money to pay for efficiency upgrades is controversial. It rewards those who built “on the cheap”, partly at the expense of taxpayers who built responsibly for high efficiency. But, with the right financing mechanisms, public financing can happen without added taxes. The key is using anticipated energy cost savings to pay off the financing. Spread loan payments over a longer term than needed for savings to pay for the improvements. This makes monthly payments (lowered utilities plus loan principal and interest) smaller right away. During the loan period, loan P&I remains fixed, instead of rising with energy costs. And after the loan payoff, whoever pays the utility bills pockets the savings. Most such loans would be “microloans” to homeowners, renters, and small businesses. Origination costs for traditional loans would be impractically high. Streamlined processes are needed, so just verify that improvements are justified by savings, and that buildings will last longer than the loan term. But what about collateral and paperwork to guarantee repayment? Forget it. Make loan repayment part of the utility bill. Non-payment causes a utility disconnection, same as always. And non-payment risk is lowered, since bills decreased when improvements went into service. The loan is applied for by, and follows, whoever is paying the utility bill. Improvements happen without additional tax dollars. City, county, or state revenue anticipation bonds provide capital at low rates. This proposal, on its own merits, makes sense. In the context of future energy shortages and global warming, it’s imperative. Have special interests prevailed on Republican legislators to block this? If Oregon or Federal legislators can’t get this done, local governments should. Just do it! Do you know about PAYS (R)? "Pays= Pay-as-You-Save" a program whereby utilities fund all those low-hanging opportunities and the owner pays the loan back with the energy savings automatically through the utility bill. Publicly owned utilities can start tomorrow; investor-owned utilities would need to be directed to do so by the PUC, but it's a great way to fund all those things you're talking about. "There are far more than 600 MW of untapped electrical energy savings in Oregon." I don't believe I ever said we should overlook conservation. My point was that our guest lecturer's main point is that we should take Boardman offline and have no replacements. On the nuclear waste issue - there is no way to completely eliminate nuclear waste. However, there are ways to reprocess and reduce the volume by a very large percentage. We prohibited this in the US because of non-proliferation concerns. A sensible nuclear scheme would include a life cycle commitment - reduction through reprocessing and long term storage in a scientifically planned repository. @ Steve: The conservation IS the replacement. The cheapest power you ever buy is the power you don't need to buy. Safe storage of nuclear waste is a highly debatable proposition. Wikipedia's article "Radioactive waste' has information about the subject. George Seldes note about big screen and plasma tv's sucking up lots of energy relative to their smaller CRT predecessors was interesting to me. If that's true, it makes me feel better about not springing for an LCD. According to PGE's own power sourcing information, the Boardman and Coalstrip power plants contribute 26% of the energy resource mix. A good resource doncument on this very topic is the Carbon Free Prosprity Report published in October 2008. Part of this report focuses on energy securtiy and the clean tech market place in the PNW. @ Matt T: Got a link to that report? Also, Coalstrip being in Montana and all, I think the issue for Oregonians is Boardman. GAS: Here is the link to the prosperity report. I would add that although Coalstrip is in Montana, any environmental impact and especially CO2 emissions is at least a regional issue, hence the WCI. Regardless, PGE also is listed as a power purchasing customer of Transalta's coal fired power plant in Centralia Washington. Many people don't know that there is large open pit coal mine just north of Portland. Do a google earth search for Transalta coal mine centralia washington. Check out the sludge pools and the surrounding countryside. @ Matt: Thanks for the link. I appreciate your mention of Centralia, the other abomination in Oregon and Washington. Yes, that is a tumor on the body politic. What to do about grid power purchases is a different matter. If you look at the 2007-9 Energy Plan put out by the Oregon Department of Energy, it says that coal provides 41% of our electricity, just an eyelash behind hydro. But obviously most of that is imported power produced from Centralia and Coalstrip and even further. Since we all share the same atmosphere, we make no headway if we simply move coal combustion elsewhere. On the other hand, the sooner we shut down Boardman, the better off we'll be in terms of health, meeting our renewable energy targets, economic well-being, and the quicker we'll be able to persuade Washington UTC to shut down Centralia. Whether we'll be able to influence Montana is a far tougher question. But, doing nothing about Boardman until you can be sure you can shut down all the other coal in the region is like the first fire company sitting on its hands when the alarm comes in, waiting for assurances that other fire companies will respond as well. We all suffer from all coal combustion. We have control over one coal plant. Ergo, that's where our efforts must begin. The electorate has already weighed in and made a decision on Boardman. Customers who pay extra for so-called green power obviously want the facility shut down, while customers who have not signed up either want the status quo or want their electricity supplied at an even lower price tag. Given this mandate, it should only be the people who have signed up to pay extra that bear any costs of retrofitting Boardman and/or any of the added expenditures for replacement powerm including the financial responsibility to shut down Boardman if closed. @ Reddy KW: Fine, so long as those of us who are paying a premium for that green power now get to keep paying the same rates when the carbon taxes come and the costs of responding to climate chaos kick in.